There was a flurry of excitement on Twitter last Friday with some speculation about beer and wine license activity for ~STATE BIRD PROVISIONS~, an upcoming restaurant project from Stuart Brioza and Nicole Krasinski, the beloved and talented culinary team that was behind the now-shuttered (and still-missed) Rubicon. Well, now I can let the bird out of the bag: they are opening their highly unique concept in a long-vacant space that flanks the back of The Fillmore, at 1529 Fillmore Street. Anyone who fondly remembers the cuisine at Rubicon will recall Brioza’s and Krasinski’s flavors that spanned a variety of regions, from France to America to Spain to Japan, utilizing beautifully sourced and highly seasonal ingredients. Well, get ready to experience them in an entirely new way, because instead of ordering appetizers and entrées off a set menu through a server, an array of dishes are going to be arriving to your table via cart and tray. Imagine a server presenting your table with a tray of six identical starter-sized plates of Brioza’s famed crispy spiced quail (which incidentally inspired the name of the restaurant)—your table will be able to select as many as you want. And then a little while later, a cart will wheel up to your table with another selection of dishes—like a geoduck clam and potato salad, or perhaps chicken hearts and salsa verde—fresh out of the kitchen. And if your table is pining for another round of a particular dish, say, the cecina of beef top round with spicy eggplant, or the milk pudding dessert with satsuma and shaved deglet noir dates, a server can relay the request to the kitchen. The plan is to offer upwards of 40 different dishes, which will constantly shift based on the whims of the kitchen. The experience will feel a bit dim sum-like, with a touch of a tapas, izakaya, and hors d’oeuvre spirit. There will be a few larger plates available each night, with a tight printed menu listing a few consistent items, like salads. Dishes will range from $2-$15, with the larger plates costing a bit more. It’s a fun concept Brioza and Krasinski have had in the back of their minds since they first met, and this space presented them the perfect opportunity to bring it to life. State Bird Provisions will be open nightly from 5pm-12am. The pace is designed to be quick and engaging—so whether you are swinging by for a bite before a show at the Fillmore or Yoshi’s or the Boom Boom Room, a movie at the Kabuki, or maybe it’s a pit stop after grabbing drinks at DOSA or Rasselas, you can scale your meal accordingly. There will even be a cashier in an effort to streamline the whole experience. Beer and wine will be offered, with about eight beer selections (both on draft and bottled), and a simple list of 10 or so well-chosen wines clocking in at $40 or less. So, let’s talk layout. The first thing passers-by will notice about the space is a side view of the kitchen crew hard at work in the front window. Upon entering the restaurant, there will be an open kitchen with a long line on the right, and a small stand-up bar will run along length of the kitchen (there won’t be any counter seats, however). Diners can be seated at tables in the back of the restaurant—there will be room for just shy of 50 guests in all. I’ll be able to share more design details soon, and other exciting components to the project. But for now, I know a lot of us will be looking forward to November, the current targeted opening date. 1529 Fillmore St. at Geary. 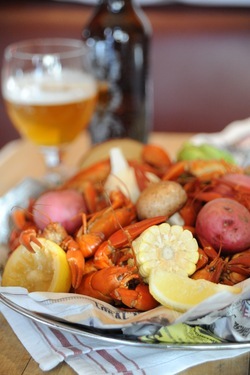 Boiled crawfish; photo by Liza Gershman. Opening on Thursday June 16th in the former Citizen Cake space in Hayes Valley is ~BOXING ROOM~, the latest project from The Absinthe Group (which includes Absinthe Brasserie & Bar, Arlequin Café, Arlequin Wine Merchant, and Comstock Saloon, in partnership with former Absinthe head bartenders Jonny Raglin and Jeff Hollinger). Chef Justin Simoneaux, a southern Louisiana native, started cooking in a New Orleans seafood restaurant at age 15 (yeah, that’s pretty dang young)—locally, he has worked at Le Petit Robert, COCO500, and The Moss Room. Simoneaux’s menu of Cajun and Creole dishes will feature some California influences, like roasted Delta asparagus ($12) with Louisiana blue crab, cayenne hollandaise, and herbs, and fried Pacific oyster salad ($10/$15) with baby spinach, fennel, and Herbsaint vinaigrette. Larger dishes include a Louisiana seafood po’boy ($15), crawfish etouffée ($19), and Gulf flounder à la meunière ($21); you can view the opening menu here. There will also be a raw bar, an extensive list of beers on tap, and a variety of wines (with six on tap), and desserts from Absinthe’s pastry chef, Bill Corbett. Zach Pacheco is the general manager (he worked with Simoneaux at The Moss Room); The Absinthe Group wine director, Ian Becker, also the manager for nearby Arlequin Wine Merchant, will co-direct the beer-and-wine program with Pacheco. Sorry folks, no cocktails. As for the question-inducing name (no, it has nothing to do with heavyweights and punching bags), it was inspired by the original use of the location: the former 19th-century Standard Shirts Factory. The restaurant was designed and restored by Sagan Piechota Architecture (Arlequin Wine Merchant, and the new Piccino), working with Bernardini Construction. Elements include a zinc-topped beer-and-wine bar, three custom five-foot chandeliers, some booth seating overlooking Gough Street, deep-red polished concrete floors, and a white-tile-and-stainless-steel open kitchen. Hours will be 5pm-2am nightly (last food order at 1am). Weekday lunch and weekend lunch will include some “bayou brunch” items, and will launch about a month after opening. 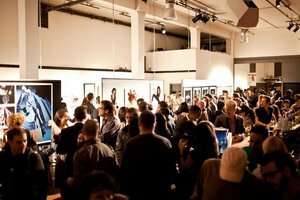 Busy night at 111 Minna; Facebook photo by Michelle Tholen. Big news at ~111 MINNA~ in SoMa: a permanent restaurant called ~DA BETTINA~ will be opening in the longstanding gallery/event space at the end of August. Chef Josh Birch is spearheading the project (which he named after his mother), and is working closely with 111’s owner, Eiming Jung. Birch—who is responsible for recently breathing new life (and the tasty pizzas) into the Orbit Room—will be preparing a sit-down lunch of rustic dishes like baked pastas, pizza, sandwiches, salads, and heartier selections like duck confit and porchetta. Birch grew up on an organic farm (Flora Bella Farm), and will be getting some specialty ingredients from his mother’s Bee Green Farm; he started cooking at an early age, staging with L.A. chefs like Suzanne Goin and Corina Weibel (Canelé). Birch is going to be installing a custom oven from Italy, and there’s room for up to 120 seats. There will be a “significant” wine program, and the cocktails will also get revamped. Lunch will be served from 11am-3pm, and then an affordable happy hour menu will kick in, making it a great spot for an after-work drink and bite while you check out the latest art installation. 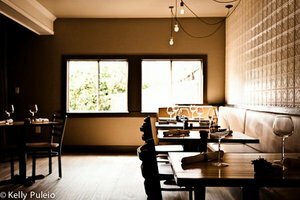 Da Bettina will additionally handle the catering for events at 111 Minna, which previously had to bring in external caterers. For those who need a quicker lunchtime meal, there will also be a take-out window called ~ANNA BELLA~, offering a “lunch CSA”—you can order ahead, and will be able to pick up your lunch in a to-go container while dropping off a container from a previous lunch; items will be priced at $10 or so. There will also be coffee and handmade sodas. Stand by for opening news and more in the coming months. One more project for the soon-to-be-very-busy Josh Birch: he is currently remodeling and taking over the ~TAZZA D’AMORE~ space on 16th Street in the Castro, reopening it as ~CAFÉ SOPHIE~. 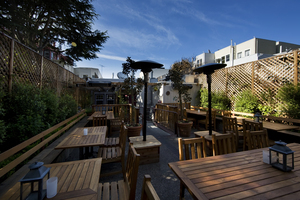 There will be a variety of pressed sandwiches, pizzas, cheeses, and vegetable dishes, along with baked goods that will come from a baker at Orbit Room who has worked at Firebrand and the SFBI (San Francisco Baking Institue)—there will be quiches, scones, “pop tarts,” and other fresh-baked pastries. Birch is partnering with Hank Gold on the project. Hours will be 7am-9pm; the soft opening should be around Thursday June 16th or so. 3463 16th St. at Sanchez. Sugarlump interior; Yelp photo by fat c.
Over on 24th Street, Sugarlump café is soon going to host a casual dinner service six nights a week through ~SOUS BEURRE KITCHEN~. Chef Michael Mauschbaugh is setting up a kitchen in the space, and is going to offer a nightly changing menu of Italian and French country kitchen dishes. He has worked at Eccolo, Waterbar, Bacar, and Spire, and was inspired by the hyper-local cooking ideology while working at Lucia’s in Minneapolis. Mauschbaugh’s menu will be primarily small plates priced at less than $15 each, ranging from charcuterie to a Hoffman Farms chicken dish to quail with a farro-panzanella salad. He will be sourcing locally (a family friend has a farm in Valley Ford), and hopes to exclusively use ingredients from the farm within a year. He also hopes to do farm tours and dinners down the road. Dinner service is due to start before the end of the month; follow Sous Beurre Kitchen on Twitter for updates. I love the groovy décor at Sugarlump, which should also be serving beer and wine by the glass soon as well. Hours for dinner will be Mon-Sat 5pm-10pm. 2862 24th St. at Bryant. According to a license transfer posted a while ago, ~TWO SISTERS BAR AND BOOKS~ is taking over the Marino space in Hayes Valley; I finally got to track down and catch up with the new owners on their plans. The two sisters, Mikha Diaz and Mary Elliott, were inspired traveling throughout Eastern Europe five years ago; namely, by a bookstore in Krakow and the Viennese coffehouses. Add in a love of neighborhood bars and the Brooklyn DIY aesthetic and local food movement, and you can start to get a sense of what they’re going to be aiming for with Two Sisters. There will be a community lending library of books (they are aiming to have a retail license and sell books later), and beer and wine will be available (they’re currently applying for a full liquor license). The menu will feature local meats and cheeses, plus soups, salads, some limited entrées, and dessert, plus coffee service. One more plan on their radar: to get a parklet by next spring. In the meantime, I’ll keep you posted when the opening is close. I loved this place when it was Mad Magda’s; happy to see something a little bohemian return to the space. 579 Hayes St. at Laguna. 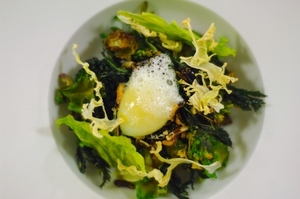 Another version of the brassicas dish; photo by Blair Sneddon Photography. All kinds of things going on at ~SAISON~ this month: there are the special Jeremy Fox SMITH@Saison dinners next week, and this Tue-Thu, chef Joshua Skenes will be previewing some of the dishes he is going to be serving while at the Food & Wine Classic in Aspen next week. For example, fans of his brassicas dish will want to check out Brassicas 3.0, various shoots, leaves, buds, and flowers in the brassica family. It’s cooked in three layers: slowly roasted over the embers, poached in bouillon of bonito and seaweeds, and dehydrated or grilled slowly over the fire to be crisp, served with toasted grains, cauliflower royale, and a sea lettuce vinaigrette. (Yeah, sign me up.) There will be a full tasting menu for $98 (instead of the usual $128), which can range anywhere from 7-11 courses. There is also the option for wine pairings. Call 415-828-7990 for reservations. The patio at The Tipsy Pig. Some new meal options for you. Starting this week, ~THE TIPSY PIG~ in the Marina will be opening for lunch Wed-Fri at 11:30am. The patio will be a perfect spot to dine on a fried chicken sandwich or a Niçoise salad (you can view the entire menu online here). Not too far away in SoMa, ~ROE~ is reopening for lunch and to-go service on Wednesday June 15th. The new executive chef, Patricia Blecha, is offering lunch items like The Big Pig (ham, Niman Ranch bacon, caramelized onions, melted provolone, smoky barbeque sauce, and housemade Tabasco cream cheese on a bistro bun) and daily blue plate specials, Mon-Fri 11am-2pm. There’s also a new happy hour menu Mon-Fri 5pm-8pm. Don’t forget, ~COTOGNA~ starts their new Sunday Supper service this Sunday June 12th. Four courses for $40 a head, 5pm-9pm. And over in Laurel Heights, the current owners at brunch stalwart ~ELLA’S~ started dinner service, with classic American dishes like fried chicken, grilled steaks, seasonal salads and soups, and a hamburger, as well as pancakes and chicken hash for those who like breakfast for dinner. As always, everything is baked on premise (like the breads, pastries, and pies). Some random openings and news around town for you. 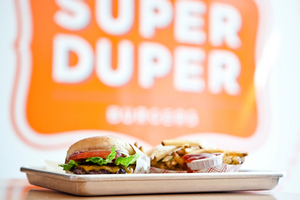 First up, ~SUPER DUPER~ is opening a second (and very spacious) location this Thursday June 9th at the former Sellers Market location on Market Street. Keep your eyes peeled for a free burger hour (a “Twitter Feed”) for Super Duper Twitter followers and Facebook fans on Wednesday June 8th from 1pm-2pm. (FYI, a third location will open this fall in a former Jack in the Box retro-looking structure in Mill Valley.) 721 Market St. at Grant (between 3rd/4th Streets). 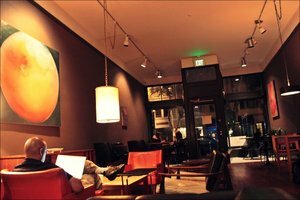 Eater mentions the quickly closed Pudong space in the Castro (yay, I get to make one last joke about the wildly inappropriate name!) appears to be reopening as ~GINGERFRUIT~. A paid-for sponsorship space on Yelp mentions the opening is Wednesday June 8th, featuring “Asian Fusion Tapas and a full bar” with “fruit-infused drinks.” 2029 Market St. at 14th St., 415-252-0700. A tablehopper tipster saw a sign in the window of ~AL’S SUPER CAFÉ~ (formerly Al’s Café Good Food ) in Bernal Heights mentioning a reopening (with the new owners) on Friday June 10th for breakfast all day and lunch at 11:30am. 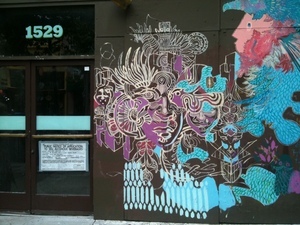 3286 Mission St. at 29th St.
~WISE SONS DELI~ is moving their pop-up brunch from Jackie’s Vinoteca & Café to ~HEART~ in the Mission—they will be off this Saturday June 11th, returning June 18th. Mark your calendars, because The Tamale Lady is turning 60 on Tuesday June 21st, and ~ZEITGEIST~ is throwing her a big 60th birthday bash, starting at 6pm. The general public is invited. And in SoMa, the former goodpizza location in the goodhotel is reopening as ~SIDEBAR WINE TAVERN~, serving dinner to start, with breakfast and lunch starting at the end of the month. The lunch menu will have salads, soups, and sandwiches, and the dinner menu has a burger, oven-roasted chicken, and a few eyebrow-raising dishes like truffle-chicken alfredo. There will be eight Californian wines on tap and glycol-cooled pints of beer. Initial hours are nightly 5pm-close. 112 7th St. at Mission. 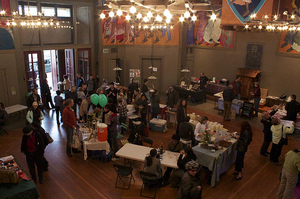 Photo from New Taste Marketplace. ~NEW TASTE MARKETPLACE~ returns this Saturday June 11th from 12pm-5pm, with everything from handmade buttermilk biscuits with molten cheddar gravy, caramelized onions, and herbs from Biscuit Bender to Sicilian baked goods from Dolce Sicilia. Please remember, it’s a fundraiser for the The Food Pantry—which distributes groceries to over 600 low-income participants every week—so a donation at the door is appreciated. St. Gregory of Nyssa Episcopal Church, 500 De Haro at Mariposa. And on Sunday June 12th, ~LA VICTORIA BAKERY~ is launching Slow Sunday taco night on the second and fourth Sunday of every month. Check out the menu (which is more than just tacos) from Luis Villavelazquez here. 5pm-9pm. 2937 24th St. at Alabama. Plate Shop photo by Kelly Puleio. After the exodus of chef Kim Alter and some kitchen crew members from ~PLATE SHOP~ a couple weeks ago, I heard back from partner Matt Kahn that the former partners of 1550 Hyde (Peter Erickson and Kent Liggett) have been hired. According to this post in the Inside Scoop, chef Erickson will be launching a California bistro menu in the coming week, and Liggett will be acting as GM (Steve Matkovich, who acted as an interim chef, also seems to be staying on). They are keen to maintain a neighborhood restaurant vibe. On a somber note, I wanted to post some information about a memorial for the very brave ~SCOTT LAWRENCE~, who sadly passed away somewhat unexpectedly a few weeks ago (the actual cause of his passing remains unknown). He was a CIA grad who worked at Spruce and AQUA, and was believed to be on the mend after a tough and courageous battle with oral tongue cancer. His memorial will be at at The Women’s Building in the Mission on Sunday June 12th from 11am-2pm, and is open to anyone who would like to come and pay respects, to gather with friends in and outside of the industry. After the more formal portion of the memorial, the group will be moving to Dolores Park. Details about the memorial can be found here. The event organizers are hoping to also take up a collection to donate to the Oral Cancer Foundation in his name at the memorial—you can read more on his memorial page here. Best wishes to all his family, friends, and loved ones touched by this tragic loss.